​What is Competency-Based Education in ACE? The primary and the crucial difference between a competency-based system of teaching and assessment and a traditional model, is that students begin a learning pathway based on assessed skill level in each content area, and not on arbitrary placement in grades (based on age). Each content area (i.e. English, History, Math, and Science) is divided into 6 week courses. After being assessed for their knowledge in each content area, students are placed into two courses at a time that put them at their "learning edge" i.e. challenging, but not overwhelming. Students progress from course to course in each content area, based on their ability to demonstrate mastery in each area, independently and multiple times. Once they meet the assigned benchmarks in each course, they become "competent", and move on to the next course. If they finish a trimester without demonstrating competency in an area, they do not fail. Instead, they repeat that course when it is offered next. For more information about he ACE trimester schedule, see this example. Participation in the ACE program has created measurable results for students. 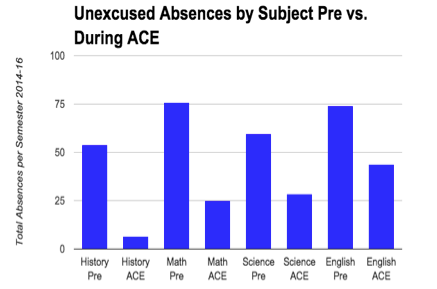 In only one year, students involved in ACE demonstrate a reduced number of unexcused absences in all subject areas. The total number of unexcused absences for this year's cohort was reduced by at least 50% in each subject area. 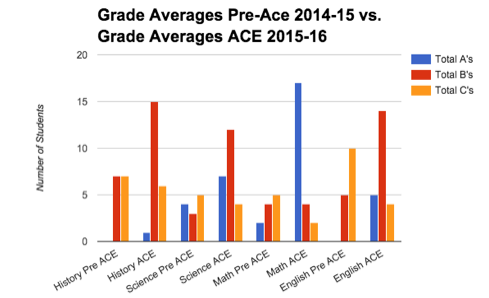 As the chart below demonstrates, ACE students also realized a substantial increase in grades when compared to classroom performance before joining the program. On average, student grades increased a full letter grade across all subject areas. The most impressive change is noted in Math, where the average pre-ACE grade of 70 (C-) jumped two full letter grades to an average of a 91 (A-). Please note: You will notice that the total number of students varies across this graph. This is because, Pre-ACE, students also earned D’s and E’s in their classes. Since ACE does not use D’s or E’s, we did not think it was appropriate to include those grades. Although students are not given letter grades in ACE, we do translate their levels of competencies into letter grades for their college transcripts. These equate to: Basic Competent= C, Competent=B, and Highly Competent= A. ACE has recognized the importance of making digital literacy central to student learning to prepare them for the 21st Century work world. All students in ACE have a Chromebook and many of their assignments require them to use the BHS digital platform, Canvas, and/or Google applications to create and submit their work. This intentional approach to learning through technology and with teacher support is called Blended Learning. Since ACE teachers post curriculum and assignments on Canvas, students can access their learning at any time and move at their own pace. However, ACE classes are not online learning since the teacher still plays a critical role in providing some direct instruction and often providing quick and timely feedback via Canvas. To keep up with the latest resources on competency-based education, please see our reading list.